Getting cold feet when hiking in winter is an unpleasant experience, but getting slipped and fall down on your bum is no less bad. Although winter boots have outsoles with specially designed tread that grips on slick wet snow, it’s often not enough when the ground is covered with slippery ice, turning it into glass-like smooth surface. You’re going to need a traction device for that. And don’t think that snow cleat is only needed by those who aim to blaze their ways through winter trails. Freezing rain that pours down at night often – if not always – leaves some black ice that turns sidewalks into a slippery nightmare for urban pedestrian. You don’t want to run hastily to catch your bus only to tumble down like a silly cartoon character, do you? More than just an embarrassment, falls and slips can also lead to injury, though not likely to be a fatal one. Below are the best microspikes that can give your boots extra traction, whether you’re on the trail or on your way to Starbucks. Traction device is designed to be different one to another. 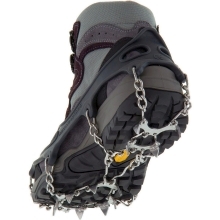 Depending on its designated use, some snow cleats may look like a simple rubber band with steel coil all over them. Such minimalist design is intended for use around city streets where you may walk into icy sidewalks. 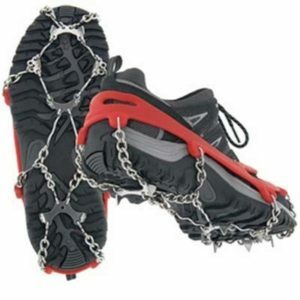 Other microspikes incorporate chain combined with real small spikes that bite into ice to make sure the boots grip the ground firmly. These are more ideal for hiking where you might need to cover patches of ice or perhaps even a frozen lake. There are also those created for runners. They’re more lightweight and flexible but not less grippy than other traction devices. We’ll talk more about it in the buyer’s guide at the lower portion of this article. 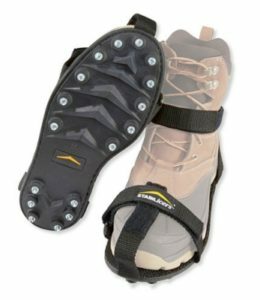 A lightweight solution for those who want to go about their daily activities safely no matter how iced-slippery the ground is, Stabilicers Walk Traction Ice Cleats feature a plastic platform that flexes to adhere to your boots outsoles. There’s a set of tiny steel teeth coming out of the said plastic platform to provide extra grip on hard pack. They’re concentrated on the heel and right under your forefoot. Also, they’re set at various angles to maximize the traction. Interestingly, the whole platform is flexible enough to be folded in two, in case you want to take it on a travel with you. Just be sure to cover the cleats, because no matter how small they are, they can still rip a hole on your bag. 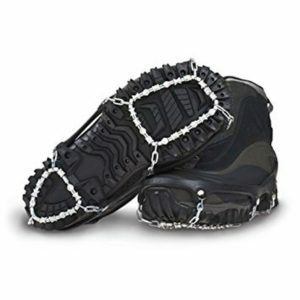 Taking a different approach, YakTrax designs its snow cleats with stainless steel coils, instead of the usual small spikes or protruding studs. Some of you may wonder if it’s safe enough because coils don’t seem to grip too securely on icy surface. Well, nothing is what it seems, so they say. 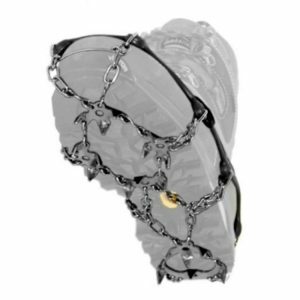 YakTrax Pro snow cleats may not look as aggressive as other models, but the coils do provide great traction even on a glassy surface after a night of frigid temperature. The rubber frame has been tested to remain freeze-resistant up to -41F. To attach it more securely on your boots, there’s a removable strap that goes over your front foot. As for durability, expect it to last five winters or more, as long as you refrain from using it on bare hard pavement. Kahtoola Microspikes has all it takes to be the best winter traction device, not only for hikers but also for year-round runners and those simply wanting to have a safe walk in the suburb. For one thing, it’s very durable. All of its parts are made of quality materials. The spikes are strong enough to withstand impacts on concrete, which is unbelievable given their small size (each spike is 3/8-inch stainless steel). There are 12 spikes on each pair and they’re connected to each other using chain. At the top, it utilizes flexible rubber harness with no strap. This is a big plus, since it’s very easy to put it on. Just put in your boots or shoes through its opening, and pull the harness up. Can’t be any simpler than that. The traction grippers on IceTrekkers Diamond looks like an ornate necklace, but instead of sparkling beads, it consists of hardened steel alloy, and instead of usual thread, it uses steel aircraft cable. It’s then connected to an elastic freeze-proof rubber band with chains. It has no strap to secure the rubber band on your boot, so make sure you choose the right size so it can hug your boot firmly. As far as traction is concerned, IceTrekkers Diamond meets any expectation you have from a microspike. 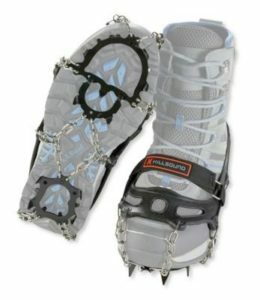 It grips nicely on snow and ice and doesn’t destabilize your feet, which the more aggressive traction device often does. Sadly, since it’s not stainless steel, it’s more prone to rust, though it doesn’t seem to affect its performance on ice. Hillsound is a respectable brand that manufactures various hiking accessories. The one that elevates its name, however, is its microspikes. 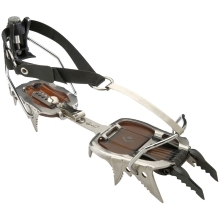 Many like to compare its trail crampon with the one made by Kahtoola. Well, both microspikes are great company to have when hiking or backpacking in winter – they’re both robust, well-built, and stable under heavy load – though Hillsound Trail Crampon offers better traction, thanks to the larger spikes. If you often find yourself on thickly ice-covered trail with its upper surface having softened a little, Hillsound Trail Crampon works the best. Still, it’s not without flaws. First, the spikes are not stainless steel, so take more care after using it if you hate to see it rust. Next, larger spikes means heavier weight, which you should give a second thought if you plan for long-distance trek. As you can tell from its name, Stabilicers Maxx brings more traction than the company’s regular snow cleats above. It’s more suited for those who work outdoor in winter like ice fisher, rescue teams, police, and many others. The added grip is provided by 16 steal cleats (on each pair) that look more like a set of screws, instead of spikes. So, you can bet that it’ll be more stable under loaded weight and allows for faster pace. It’s replaceable too, in case yours got all rusty because you forget to clean it after use. Is it good enough for hiking? Well, if you don’t mind strapping the polyester webbing, then yes, it’s good enough. Polyester binding straps may last longer than rubber harness, but it’s just too much a hassle for real treks where you won’t be needing the extra traction throughout the entire length of the trail. YakTrax Run looks so much like its Pro cousin, with a little modification on the forefoot area. Instead of covering the entire soles with stainless steel coils, this model has them stretched from mid-soles to the heels only. The traction under your front foot is handled by a few carbide-steel studs. This allows for better movement on snow without reducing the grip, which is perfect for winter runners. 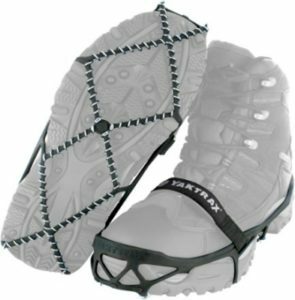 Like YakTrax Pro, it still features an elastic rubber frame that won’t turn stiff when the temperature drops even below freezing. Also, it provides an additional strap that runs over your foot to better secure the attachment. Anyway, since it’s made for runners, you can’t expect it to fit your winter / snow boots. An alternative to the previous YakTrax Run is Kahtoola Nanospikes. Optimized for runners, this traction device is so light you won’t realize that it’s attached to your shoes. You won’t find any of those chains equipped on its Microspikes counterpart. Instead, it’s dominated with rubber platform on which ten Tungsten carbide steel studs are fixed – six under your forefoot and four under your heel. The studs are big enough to grip on slippery ice, but they’re also small enough to avoid biting the ice too deeply. As such, you can keep your running pace high. You will neither slide nor find your feet planted too firmly on ice and snow. Better yet, it comes with a zipped pouch for safer storage. Sporting more spikes underneath, Hillsound Trail Crampon Ultra is geared toward more serious hiking on higher elevation. Its traction still falls short against full-fledged mountaineering crampons, but with 18 stainless steel spikes of approximately the same size as the original model, you should be able to tackle some moderate slopes. The hinge flex plate on the original version is replaced by double-link chains, making it less obtrusive as you move forward. 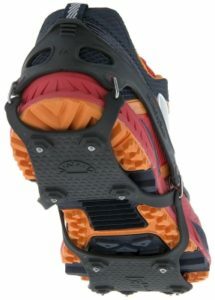 The three spikes under the heel will act as a brake as you go downhill. Above, you’ll still find the same combination of rubber harness and rip-and-stick strap. 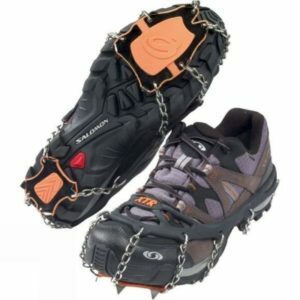 Interestingly, despite more spikes and the inclusion of chains, Hillsound Trail Crampon Ultra is lighter than the original model. Grippy traction: Obviously, you’ll want a snow cleat that grips, not too much, but enough to prevent you from sliding as you move across ice and slick snow. If you simply wish to have a safe walk from your house to the bus stop, there’s no point in getting one that has aggressive spikes. 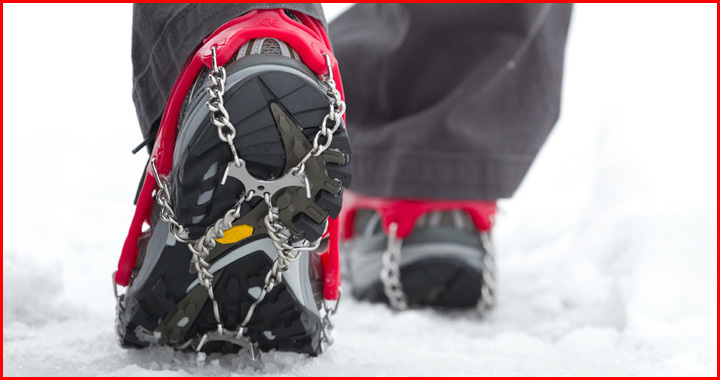 The more minimalist traction device like Yaktrax Pro will do. Durable build: Though they don’t cost you arms and legs, it’s still important to choose a microspike that can last you a few winters. The most expensive of them is sold about $70 and it’ll be a shame if that breaks after only several outings. The key is to match its stiffness with your boots’. If your boots flex, then don’t choose a stiff traction device. Good fit: Like all footwear, good traction device fits you perfectly. One that wraps around your boots too tightly can damage its upper and even leave some uncomfortable pressure points on your feet. On the other hand, one that’s too loose won’t be able to keep you surefooted. If anything, it’ll only bother you. Quick on and off: This is actually more important than it sounds, especially if you hike on cold windy days. The last thing you want to deal with is gear that’s difficult to put on and off. Kahtoola Microspikes excel in this one since there’s no adjustment to be made. Just slide your boot in and pull the rubber band up. It’ll hug your your feet snugly. Even the best snow cleats will fall short off of your expectation if it’s used for different purpose from what it’s been designed for. Traction device with aggressive spikes on the undersides will wear out quickly, if you wear them on hard pavements. There’s a certain microspike for certain activity. The following questions should help point out which one is right for you. 1. How are you going to use it? A number of winter traction devices are are designed for slow walk, either it’s on the trail or sidewalk. A few of them, on the other hand, cater to the need of winter runners. These are like YakTrax Run and Stabilicers Sport. They’re more lightweight and capable of withstanding impact repeatedly. Needless to say, they also flex in accordance with your trail running shoes, which some snow cleats can’t do. 2. Where are you going to use it? If it’s just to keep you from slipping while strolling around town, then there’s no need to get a snow cleat with aggressive traction. A lightweight winter traction with minimalist steel studs or chains – such as Kahtoola Nanospikes and Stabilicers Walk – are good enough to get you to move with confidence. Exploring a frozen lake or a stream in the wild calls for different model. You will need the one that can grip more surely to the icy surface – Stabilicers Maxx and YakTrax Extreme, for example. When the going get’s steeper, you will need a mountaineering crampon. 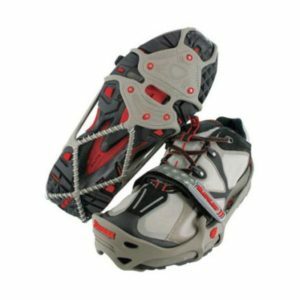 It’s heavier than common microspikes but provides significantly more traction to secure your feet as you tackle the slanting slope. Microspikes are not the only winter traction device there is. There are also full-blown mountaineering crampons and snowshoes. In the past, snowshoes were not considered a traction device because they were merely used to prevent the users from sinking knee or waist deep into the powdery snow. 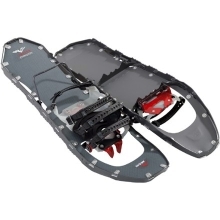 Modern snowshoes, however, are integrated with crampons. Some are solid and big enough to get you tackle steep slopes with relatively less effort. It’s still hard for the most part, but you’re going to be begging for mercy if you decide to ascend bare-booted. Anyhow, here are the differences between the three of them. Mountaineering crampons are heavier than microspikes due to the larger steel spikes they come with. You want to be careful as of when to use them. Put them on too early and you’ll find yourself dealing with fatigue faster than usual. They are most helpful when you’re ascending a steep ice-covered slope and mixed icy conditions.